If Xenomorphs have one weakness, it's strong-willed women. Vampirella is definitely one such woman, tackling any and all evils with a gleeful abandon. Pitting one against the other leaves an uncertain result, which is why Dynamite Entertainment is teaming up with Dark Horse Comics on a new crossover called Aliens/Vampirella, written by Corinna Bechko. "I've loved Alien since I first saw it as a kid on a crummy old TV in a well-lit room and got scared half to death anyway," says Bechko. "Now that I have the chance to add a little corner to that universe I couldn't be happier. And pitting such an implacable horror against Vampirella? That's a meeting that definitely produces very fertile story-telling ground. The Alien franchise has always thrived with strong women in the lead. Smart, self-assured Vampirella is a joy to write for, even when she may have met her match." 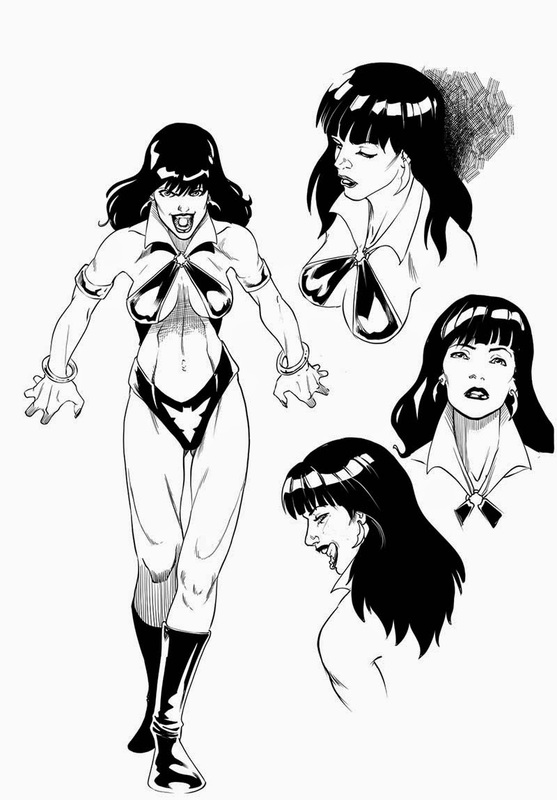 Vampirella is one of the comic industry's leading ladies, due in no small part to Dynamite Entertainment's stewardship of the character. Dynamite has published two volumes of a monthly series, several miniseries and one-shot specials and crossovers with multimedia brands and comic book peers. For over twenty-five years, Dark Horse Comics has been the comic book home to the Aliens franchise, expanding upon the universe of terror first introduced in the 1979 Ridley Scott-helmed sci-fi/horror masterpiece. "Aliens / Vampirella continues our string of successful crossovers with Dark Horse Comics. This is an incredible series -- featuring the iconic Vampirella against one of Fox's icons, Aliens -- and we're proud to have Corrina Bechko as the architect," says Dynamite CEO/Publisher Nick Barrucci. "When I first heard about the Vampirella / Aliens crossover, I thought to myself, 'How is this going to work?' But then I read Corinna Bechko's outline for the series, and all my doubts were dispelled," says Dark Horse V.P. of Publishing Randy Stradley. April 24, 2015, Mt. Laurel, NJ: Dynamite Entertainment is proud to announce the upcoming 2015 crossover, Aliens / Vampirella, pitting the iconic horror heroine against the Xenomorphs popularized in eight feature films and numerous Dark Horse Comics series. Written by Corinna Bechko (Star Wars: Legacy, Savage Hulk), the sci-fi horror crossover marks the first time that the two comic book universes collide. Writer Corinna Bechko says, "I've loved Alien since I first saw it as a kid on a crummy old TV in a well-lit room and got scared half to death anyway. Now that I have the chance to add a little corner to that universe I couldn't be happier. And pitting such an implacable horror against Vampirella? That's a meeting that definitely produces very fertile story-telling ground. The Alien franchise has always thrived with strong women in the lead. Smart, self-assured Vampirella is a joy to write for, even when she may have met her match." For over twenty-five years, Dark Horse Comics has been the comic book home to the Aliens franchise, expanding upon the universe of terror first introduced in the 1979 Ridley Scott-helmed sci-fi/horror masterpiece. Featuring the nightmarish extraterrestrials as imagined by H. R. Giger, the Dark Horse comics have enjoyed unprecedented success in both the hobby and mass markets. Throughout the years, the Xenomorphs have interacted with many staples of the comic book industry, including Batman, Predator, Terminator, Judge Dredd, Superman, and Green Lantern. Aliens / Vampirella will be solicited in Diamond Comic Distributors' Previews catalog, the premiere source of merchandise for the comic book specialty market. Comic book fans are encouraged to reserve copies of Aliens / Vampirella with their local comic book retailers. Aliens / Vampirella will also be available for individual customer purchase through digital platforms courtesy of Comixology, Dynamite Digital, iVerse, and Dark Horse Digital. Founded in1986 by Mike Richardson, Dark Horse Comics has proven to be a solid example of how integrity and innovation can help broaden a unique storytelling medium and establish a small, homegrown company as an industry giant. The company is known for the progressive and creator-friendly atmosphere it provides for writers and artists. In addition to publishing comics from top talent such as Frank Miller, Mike Mignola, Neil Gaiman, Brian Wood, Gerard Way, Geof Darrow, Guillermo Del Toro and comics legends such as Will Eisner, Neal Adams, and Jim Steranko, Dark Horse has developed its own successful properties such as The Mask, Ghost, Timecop, and SpyBoy. Its successful line of comics, books, and products based on popular properties includes Star Wars, Mass Effect, Buffy the Vampire Slayer, Aliens, Conan, Avatar: The Last Airbender, Halo, Serenity, The Legend of Zelda, Game of Thrones and Domo. Today Dark Horse Comics is the largest independent comic book publisher in the US and is recognized as one of the world's leading publishers of both creator-owned content and licensed comics material. For more information, please visit: http://www.darkhorse.com/.